The latest from Hands off Somalia! on Said's struggle for justice. 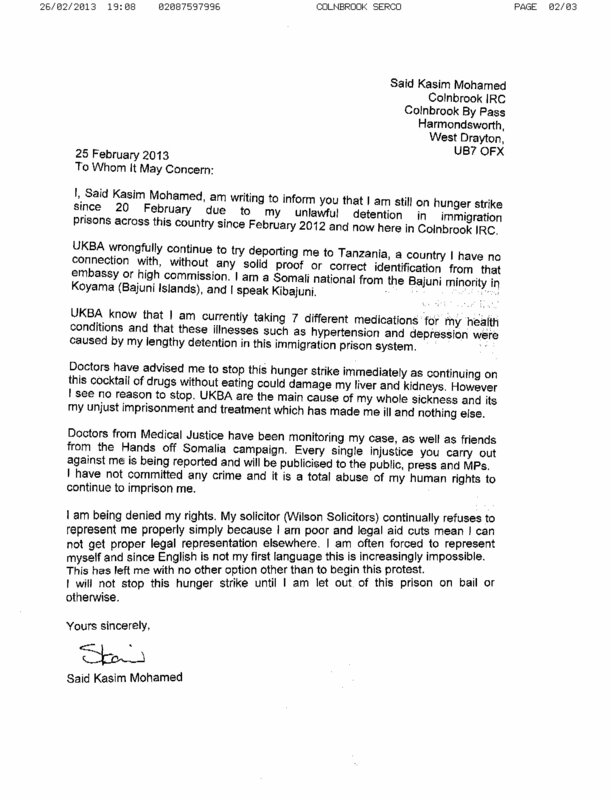 Said Kasim has informed us that he is still on hunger strike in Colnbrook IRC, now for 7 days since 20 February. Said sent Hands off Somalia (HOS) the following letter asking for it to be publicised and forwarded to all press and political groups. 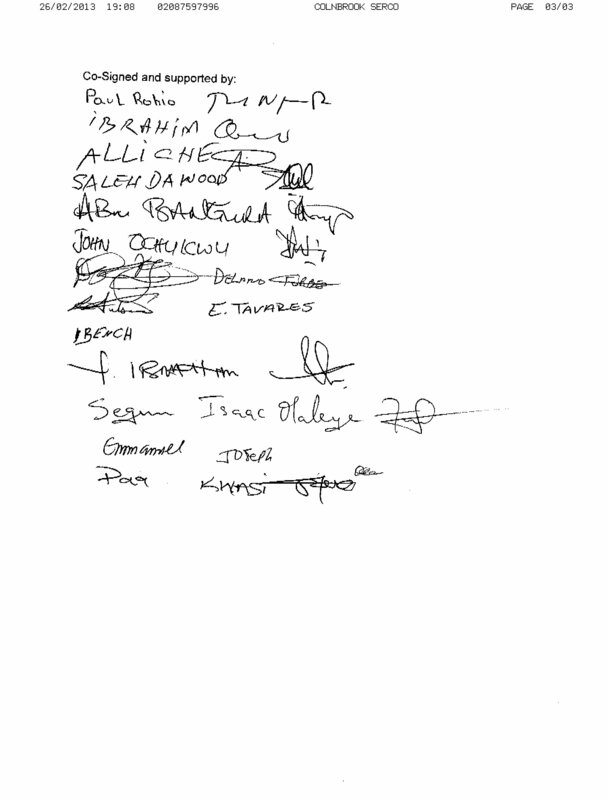 On the second page, the letter has been signed by prisoners that support Said and believe his fight is just and in the favour of all prisoners held in immigration detention centres across Britain. Yesterday Said went for bail in court but his hearing was not a success. The ruling judge denied bail on the reasoning that he deemed Said was at risk of absconding (going underground). UKBA are desperate to bury Said's case and quickly deport him to Tanzania, a country Said has no connection with. We suspect this is because Said has a pending application for judicial review against UKBA, the Home Office and security firm Reliance (Tascor) for his brutal treatment on 30 September when UKBA failed to remove Said because he resisted. Said told HOS he remarked to the bail court judge that he thought he was a racist and only backs UKBA's lies about his identity because he has no understanding of how it must be to be a black African fleeing civil war and fighting to survive in Britain. Meanwhile in Colnbrook IRC news has spread that on Monday 25 February a Nigerian man was killed inside the prison after a botched charter flight to Nigeria, although this is yet to be verified fully and UKBA deny any death has occurred. Hands off Somalia supports Said and his actions against racist UKBA. No to the criminalisation of Somali people!